Til' the law do us part? 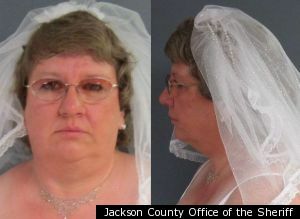 Perhaps because you only get to wear a wedding dress on your wedding day, Tammy Lee Hinton elected not to change out of her gown and veil when police took her mugshot last Saturday, just a few moments after she said, "I do." Following the ceremony at City of Zion Ministries church in Michigan, Hinton, 50, was arrested by Blackman-Leoni Township cops on a two-year-old felony warrant accusing her of identity theft, according to police reports obtained by The Smoking Gun. Authorities reportedly received an anonymous tip that Hinton would be in town for the wedding. The police report listed a Port Richey, Fla., P.O. box as Hinton's home address. As if literally being an old ball and chain wasn't enough, Hinton is also doing her best as a runaway bride. The Detroit Free Press reports that after paying her bond and being released from county jail, Hinton failed to appear for her scheduled Monday appearance in Jackson County District Court.